My mom's moving house shortly and my brother was home from L.A. for a couple of days to help her pack things up. I spent a good chunk of Friday and Saturday pitching in with the effort so now have two sets of clothes covered in a fine layer of dust. But what a trip down memory lane! While I'd either gotten rid of or taken most of my things in previous years, some stuff I didn't expect was still lying around, including notes I'd taken about my first trip to London, England a vacation my best friend and I paid for with our summer jobs when we were seventeen, a letter one of my cousins had written me when I was thirteen informing me he'd beaten my Pac-Man score (must have been a lie! ), and a letter from my aunt which included the comment that I was developing a very impressive super ball collection. 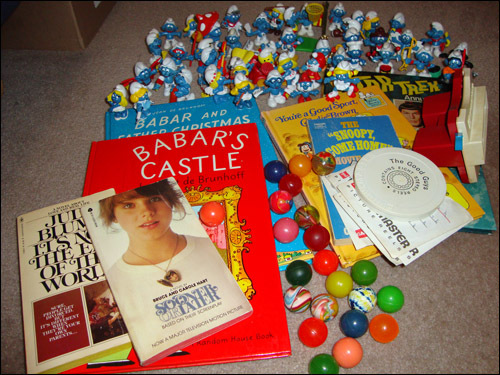 Yes, I actually had a super ball collection when I was a kid! See the below photo. As well as the things you can see in the picture, I rescued a copy of The Detroit Free Press from February 9, 1986 and issue of Time Magazine dated December 23, 1985 that I'd boxed eons ago. Actually, I'd kept a good few newspapers from that period but I just didn't have room to take all of them home with me so tossed most of them in recycle yesterday. It was interesting that I'd saved so many in the first placeI guess I thought someday I'd need a time capsule to consult (perhaps sensing that in the future I'd write a book set in the 80s??). Seeing as I'm about to resume work on the Yesterday sequel I'm extremely eager to have a read of that old copy of Time and the Detroit newspaper. And can I just say, my old View-Master is every bit as cool as I remembered! I can't imagine what younger generations would make of the thing but I absolutely adored my View-Master and looking through the slide reels of Star Trek (both animated and from the original TV show), Charlotte's Web, Charlie Browns, Land of the Lost, Scooby Doo and Planet of the Apes (the TV show) brought my enthusiasm back in waves. You'll also notice my extensive Smurf collection from when I was eleven and twelve. Considering how many decades they've been packed away, the Smurfs remain in admirable condition. I was gleeful to discover some of the Babar books from my earlier years too. I am no less fond of Babar now than I was then and my heart leapt to see them. Now if you'll excuse me, I'm going to dust myself off and go play with my stuff!